Celebrate World Tai Chi & Qigong Day (WTC&Q Day)on Saturday, April 27 at 10 a.m. all over the world. Beginning in New Zealand, this event will spread time zone by time zone across the globe, and will include 70 countries. Celebrate World Tai Chi & Qigong Day (WTC&Q Day)on Saturday, April 27 at 10 a.m. all over the world. Beginning in New Zealand, this event will spread time zone by time zone across the globe, and will include 70 countries. Massive tai chi and qigong exhibitions will be held in public places such as parks, community centers, and tai chi schools and studios across six continents. This year marks the 15 anniversary of WTC&Q Day, organized by founder, Bill Douglas,a 2009 Internal Arts Hall of Fame Inductee. Tai Chi and qigong have been shown in research to reduce anxiety, depression, and chronic pain conditions. These practices boost the immune system, improve respiratory function, burn calories, dramatically improve balance, benefit the cardiovascular, provide powerful stress management tools, and slow aspects of aging. New York Times reported that a clinical trail at Tufts Medical Center found that after 12 weeks of tai chi patients with fibromyalgia, a chronic pain condition, did significantly better in measurement of pain, fatigue, physical function than a comparable group given only stretching exercises and wellness education. The New England Journal of Medicine concluded that tai chi might be a useful treatment for fibromyalgia and merits long-term study in larger study populations. The fibromyalgia study involved the Yang style of tai chi, taught by Boston tai chi master and YMAA author, Ramel Rones. Rones is also a disciple of Dr. Yang, Jwing-Ming. Here’s what our YMAA authors say about tai chi and qigong. “Yang Tai Chi is the most popular tai chi style, in the world, and it is practiced by millions of people every day. By practicing tai chi, you relax the mind and body deeply, which is one of the keys to maintaining and improving your health.”—by Dr. Yang, Jwing-Ming from Yang Tai Chi for Beginners, DVD. “What’s the difference between qigong and tai chi?” There is a simple answer: tai chi is qigong, but qigong is not necessarily tai chi. Qigong is the cultivation of your qi energy in the body. Tai chi is a form of qigong, but its movements may also be applied at full speed as a martial art. Both medical qigong and tai chi emphasize the power of the mind and importance of cultivating energy and evoking our spirituality.”—by Ramel Rones with David Silver, from Sunset Tai Chi—Simplified Tai Chi for Relaxation and Longevity. “Taijiquan helps release tension created by a hard day at work. Mentally and energetically tension is released from the head and other areas where energy stagnates. When this happens, we may not be able to think as clearly, we may loose our temper easily or even get headaches. Taijiquan exercise helps to redistribute this energy in our body, by leading excess energy from tense areas, so as to regain balance.”—by Master Liang, Shou-Yu from Tai Chi Chuan 24 & 48 Postures with Martial Applications. “Learn to safely use the ancient art of qigong to heal yourself and others,” says Lisa B. O’Shea, YMAA author and certified qigong therapist in Reiki and Hypnotherapy. “The Chinese word qi, means energy, and it refers to the bioelectric energy which flows through every cell of our body. Qigong, or “energy work,” is the practice of cultivating the energy in the body and harmonizing it with natural energy around us.” O’Shea is the author of Qigong for Healing, a DVD. YMAA will celebrate WTC&Q Day on April 27 at the following places. Times vary. All events are free to the public and all are welcome to participate. Tai chi and qigong practitioners, both students and teachers and those with just an interest, will commit themselves to perform, demonstrate, and exhibit tai chi and qigong forms and exercises. Those committed will perform in their local parks and public places so the community can watch and learn more about this martial art form. Boston, Mass. 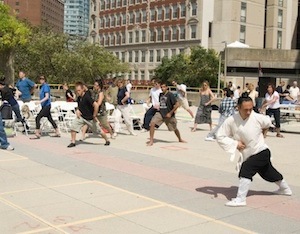 10 a.m. to 3 p.m. “Second Annual Tai Chi Day Health Festival” Boston Common at intersection of Beacon & Charles. Sponsored by Daoist Gate Wudang Arts and Daoist Benevolent Association and YMAA author, Zhou, Xuan-Yun. Featuring martial arts performances and Chinese healing arts workshops. Framingham, Mass. 10 a.m. Celebrate with Dr. Aihan Kuhn, Chinese Medicine for Health, at Framingham Common, Edgell Road, off Rt. 9 (across from Framingham State College). Features “Practice Qi Gong and Tai Chi” demonstration and several schools will exhibit various forms of tai chi. Milwaukee, Wisc. 1 to 3 p.m. at Riverside High School gymnasium, 1615 East Locust St. Milwaukee. Sponsored by Milwaukee Public Schools, Division of Recreation and Community Services, Riverside High School and YMAA Tai Chi Ch’uan of Wisconsin, led by Angela Laughingheart, school director. Event is in its fifth year. There will be demonstrations of qigong and tai chi by five different schools. Santiago, Chili 10 a.m. at Arucano Park. Av. President Riesco and Rosario Norte, Santiago Chili. First time participants in World Tai Chi Day. Sponsored by YMAA South American Headquarters led by Daniel Chadud, president. Warsaw, Poland 10 a.m. at Pole Mokotowskie, Warsaw. Sponsored by YMAA School and led by Mariusz Sroczynski, YMAA school director. Practice tai chi and qi gong in the open air in the park. Demonstrations and exhibitions. Take the Tai Chi Challenge! This massive global event will bring out the best in everyone. It’s a day to demonstrate all styles and levels of experience. You have what it takes! Some people believe that only young athletes strive to find, and pass, their limits. That people who are middle age, or beyond, are doomed to a sedentary lifestyle. Tai Chi is an exercise that challenges those beliefs. A smooth, fluid exercise system, tai chi invites people of all ages to find and exceed their limits of balance, leg strength, flexibility, mental concentration and the ability to improve health in areas like hypertension and stress.